New Balance Brandywine, New Balance Christiana, and New Balance Richmond are hosting a sock drive for the month of October “Socktober”. When you donate a pair of socks you’ll receive $5 off your shoe purchase and we will match your donation. The Delaware Store Locations will be donating to the Ministry of Caring in Wilmington, DE. Our Richmond store will be donating the socks to the Homeless Point of Entry in Richmond, VA.
Did you know that 80% of the population wears the wrong shoe size? Many feet related problems can be prevented just by wearing properly fitted shoes. Ask yourself, when was the last time I had my foot measured? We recommend that you have it measured every year. Often people have the mind set that they wear a particular size in every shoe. If I had a nickel for every time I heard the phrase I wear a size … I would be a wealthy lady! I always use the analogy “Do you wear the same size jeans in every style and every brand?” Shoes are similar in that each brand has their own sizing, there is no standard and companies make multiple different “lasts” in order to fit different foot shapes. Even Brannock devices measure different according to brands. It is best to remember that shoe fitting is an art and not a science. Use the Brannock device as a starting point and go from there. I often hear people say “I feel my heel slipping, so this must be too big.” A little bit of movement from the bottom of the shoe is normal. If you are physically coming out of the top line of the shoe when you walk then yes, it is most likely too big or too small. Should I be able to get a finger behind my heel in an athletic shoe? A properly fitted shoe should leave about a quarter of an inch in front of your big toe to the end of your shoe which will allow you to slide your foot forward, forming a gap between your heel and the back of the shoe. The foot will naturally shift forward in a shoe when you walk; therefore you want to allow just enough room so your toe nail is not being pushed back every time you take a step. If you often get black toe nails (runners/tennis toe) than you most likely are wearing your shoe too small or too narrow. Our bodies are not symmetrical and it is normal to have one foot larger than the other. We often find a half size difference between two feet. It is recommended that you always fit your larger foot. However, if the difference between your feet is a size or more, you might want to consider buying two different size shoes to accommodate both. Discuss with you Pedorthist as shoe modifications can sometimes alleviate this problem. Some shoe stores will offer a discount on the second pair when you have a significant size difference between the two feet or are wearing a brace on one foot. If you have been wearing your shoes too small, a proper size may feel a bit odd. Shoes mold to your feet over time, so sometimes we don’t realize the damage we’ve caused by wearing them too small. We’ve all heard the sayings “You don’t know, what you don’t know” and “Just because it feels normal doesn’t mean it is right”. Sometimes change is a good thing as is going outside your comfort zone. Wear the new, properly fit shoes a week or so, then put the old ones on and you might surprise yourself at how small your old shoes really were. Any brace or orthotic you are wearing, the two pairs of shoes you wear the most or shoes you’ve been having issues with, the prescription from your doctor if your doctor sent you, and the socks you will be wearing with the shoes. The barefoot running movement has been growing in popularity with claims of natural movement and gait. There is debate among runners and physicians alike as to whether this new footwear is beneficial to the long distance runner and, if so, if it is beneficial for everyone. While there have been no studies investigating injury occurrence in barefoot versus shod situations, many studies have shown difference in gait, muscle engagement and proprioception in barefoot shoes (Robbins, 1987; Robbins, 1994; Kadambande, 2006; Divert, 2005; Bruggeman, 2005) . This could be due to a vast array of variables introduced when a runner is switched into a barefoot condition. Any results may not be indicative of a more barefoot change but rather general change in footwear. Therefore, it seems appropriate to test one variable at a time. The major differences shown between barefoot and shod conditions need to be further investigated to determine which, if any, could lead to injury reduction. These include shock attenuation, peak forces, proprioception level, psychological effects and gait changes. An increase in proprioception has been shown in barefoot conditions (Robbins, 1995). Further, this increases lateral ankle stability and prevents ankle sprains. Ankle sprains own a small proportion of total running injuries so this variable seems unlikely to be a large factor (van Gent, 2007). However, increased ground feel may help runners take more care in their stride since they are able to feel the ground reaction forces. This deals with the psychological aspects of barefoot running as well and could be an important factor. Many major shoe brands market shoes to be soft, supportive and protective. This allows runners to believe their feet are less prone to injury and can result in careless gaits which can lead to overuse injury. The multitude of running shoes available now may cause a “what if” factor instilling a sense of uncertainty that the runner purchased the perfect shoe for their foot. Most running injuries stem from overuse and manifest as musculoskeleton problems such as shin splints, stress fractures and muscle strains (Hreljac 2004). Lieberman showed that peak forces were decreased with a more forefoot landing in runners. This would lessen the total peak forces on the body over the total course of a run. Other studies suggest a link between barefoot running and strike patterns (Maiwald, 2008; Lieberman, 2010; Robbins, 1994). Shod conditions showed a higher tendency to land more on the heel than the unshod condition. The world of athletic shoes is full of branded technologies, marketing facades, and false impressions. Companies write shoe descriptions so every shoe sounds comfortable, even the low end models. While often what they say is true, their claims are exaggerated, which can prove disastrous for consumers falling into the traps. It’s time to bust some of the myths associated with running shoes. Keep these in mind next time you’re looking for a shoe, and it could pay off. Width isn’t Width – Foot measuring isn’t a science, it’s an art. There are too many measurements and discrepancies on a foot to take into account. 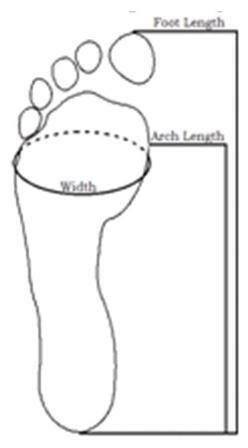 Therefore, foot length, arch length, and width are the three main measurements used to fit shoes. Foot length and arch length are somewhat concrete; they are both linear measurements, heel to toe and heel to ball of foot, respectively. Width adds another dimension which many people overlook. A Brannock Device (a metal contraption used to measure feet) measures from side to side and assigns a letter measurement (B, D, 2E, etc.) to indicate width. This can sometimes be an effective measurement, though it does not take the depth of the foot into account. The width measurement used in shoes really refers to volume, or girth. Someone with a narrow, tall foot might need a wide width to accommodate the height of the instep. The width of the foot bed reflects how much width a typical foot would need if it were to fit that specific shoe. This makes the narrow, wide foot or the wide, shallow foot difficult to fit. Every width increases ¼” in girth. That is, if you were to take a string and wrap it around the ball of the foot, the next width up would be ¼” longer. So, even if you have a narrow foot, it doesn’t mean you need a narrow shoe. Stability isn’t Stability – One of biggest misnomers of running shoes is the classification system: Neutral, Stability, and Motion Control. Neutral shoes have very little side-to-side support for the neutral or supinated foot, a foot that doesn’t need extra help. This classification is appropriate, as long as the term neutral cushioning isn’t used synonymously, which will be addressed in the next section. The categories Stability and Motion Control are a bit more deceptive. Stability shoes are any shoes designed with a medial (towards the midline of the body) support. You will often see a gray piece on the midsole of the shoe (the post) which is made of a denser material than the rest of the midsole. As the size and density of this piece increases, so does the amount of support. This medial support stops a foot from pronating by forcing it back towards a neutral position. If a supinated foot were to wear a stability shoe, the shoe would supinate it further, causing the person to walk on the outside of the foot. 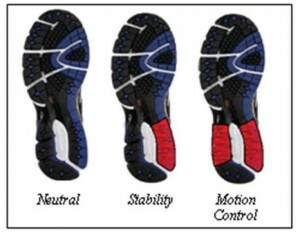 Therefore stability shoes don’t necessarily make you stable, they merely decrease pronation. Shoe companies arbitrarily draw a line at a certain point on the stability spectrum and declare anything above that line to be a Motion Control shoe, when in fact they are just heavy duty stability shoes. They do control motion to an extent, but only in one direction. There are a few shoes in production that have both medial and lateral support, which I consider to be the “true” motion control shoes. Pronation and supination are both restricted in these shoes. Though these are rare, they are beneficial to the truly unstable foot. So remember, the next time you think you need more stability, determine where you need the stability. Cushioning isn’t Cushioning – Imagine standing on two bricks. One brick is flat; the other is molded exactly to your foot’s shape. Which will feel softer? Even though two things are made of identical materials, they don’t always feel the same. Often people will ask what the softest shoe is. There is no one clear answer for this; it depends on the foot. Correct size, width, flexibility, and contour for the individual foot will increase the inherent cushioning. Focus more on properly fitting your foot, and the cushioning should fall into place. Many custom-made orthotics are quite hard. If the mold is taken correctly and the orthotic is fabricated correctly, a hard orthotic feels like pillows on your feet. Done incorrectly, the rigidity of the orthotic emerges and is uncomfortable. There are certain insoles that work to develop more contact on your foot. This leads to a very soft feel every time, though they lack significant support. So, when you think you need more cushioning, think again. © New Balance Retail - shoe & sportswear stores in Wilmington & Newark, Delaware and Richmond, VA.